In order to visit, study, work, or live in Australia you will need a visa. The Australian Migration Act 1958 provides that the visa is the sole legal basis for non-Australian citizens to travel to, enter and remain in Australia. 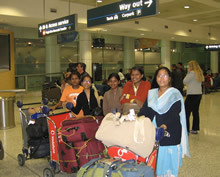 It is impossible and unlawful to enter or remain in Australia without a visa. Why do you need a Registered Migration Agent? Changing jobs is a stressful experience but moving from your home country is even more risky and stressful. It is important that you are provided the right advice inn all matters including the correct visa to apply for in your circumstances. It is very difficult to successfully apply for another visa, so it is important to get it right the first time. Furthermore once in Australia, you need to insure your visa is not cancelled or revoked. A person in Australia who has their visa cancelled becomes an unlawful non-citizen and is liable to be detained and removed from Australia. How can a Registered Migration Agent help you? Prevent common mistakes and delays caused by inexperience or incomplete preparation.